Although we know that Brahms was infatuated with his patroness Clara Schumann for many years, a more obvious 'affair' is often overlooked. He was attracted to none other than Schumann's daughter Julie and - completely contrary to his custom - dedicated the Schumann Variations to her. He composed the Liebeslieder-Walzer under the influence of this evidently upright relationship. The fact that the Alto Rhapsody followed after what for Brahms was its surprising and unhappy ending shows how serious the supposed loner took it. The Liebeslieder-Walzer became a sales hit during the composer's lifetime � which is hardly surprising when one listens to this new recording with the Norddeutscher Figuralchor led by the conductor J�rg Straube. Great complexity clearly marks the design of the Five Songs op.104. 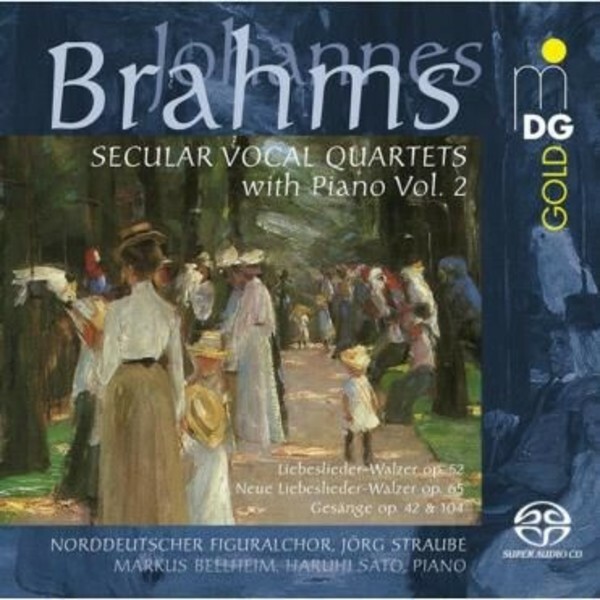 In these songs of up to six voices, Brahms is shown at the zenith of his creativity. The Norddeutscher Figuralchor masters the demanding scores with bravura, and the nobly nuanced mixing on Super Audio CD produces an atmosphere of stunning naturalness.